The San Diego Gulls scored twice in the opening five minutes, 39 seconds and added two third-period goals in a 4-1 home victory over the Iowa Wild, their 13th win in their last 16 games. Defenseman Andy Welinski opened the scoring with a power-play goal 3:52 into the game. Rookie Max Jones increased the Gulls lead to 2-0 at 5:39 of the first period with his 13th goal of the season. The Gulls (24-13-2-3) sent the puck deep into the offensive zone. Iowa goaltender Andrew Hammond tried to play the puck behind the net. Jones pressured him, stole the puck, skated in front of the goal and backhanded a shot into the unguarded net. The Wild (24-16-4-3) scored what would be their only goal with 4:55 left in the first period when Luke Kunin put in a rebound of a shot by Kyle Rau that went off a foot of Joel Eriksson Ek to Kunin. Following a scoreless second period, the Gulls regained a two-goal lead on Chase DeLeo’s goal 1:01 into the third period off assists by Justin Kloos and Simon Benoit. Kloos played 34 games this season with Iowa, then its NHL parent team, the Minnesota Wild, traded him to the Gulls parent team, the Anaheim Ducks, on Jan. 16. Kloos played one game with the Ducks, then was reassigned to the Gulls Jan. 21. Sam Steel scored an empty-net goal with 48 seconds remaining off assists by Kloos, his fourth in five games with the Gulls, and De Leo before a crowd on the fourth annual Pink in the Rink Night at Pechanga Arena San Diego announced at 10,082. The Gulls outshot the Wild 34-25, including a 16-8 advantage in the third period. “We had an excellent third period and again, it was a great testament not only our leadership, but to our young players as well,” Gulls coach Dallas Eakins said. “We have unbelievable high-character guys with extremely high standards and we never want to let off those, no matter what the score is. Gulls goaltender Kevin Boyle (19-6-1-0) stopped 24 of 25 shots for his 14th victory in his past 16 decisions. Boyle tied the Gulls goaltender single-season victory record he set last season. “He went to the All-Star Game for a reason,” De Leo said. “A lot of the games we’ve been all over the puck in the offensive zone, but he does come up with big saves that don’t go unnoticed. Hammond (11-7-1-0) stopped 30 of 33 shots. The Gulls scored on one of five power-play opportunities and killed all four of Iowa’s. Gulls defenseman Keaton Thompson was involved in his third fight of the season, brawling with Kunin at 11:31 of the second period and the Gulls leading 2-1. Thompson received a five-minute major for fighting. Kunin received a five-minute major for fighting and a 10-minute misconduct for continuing an altercation. 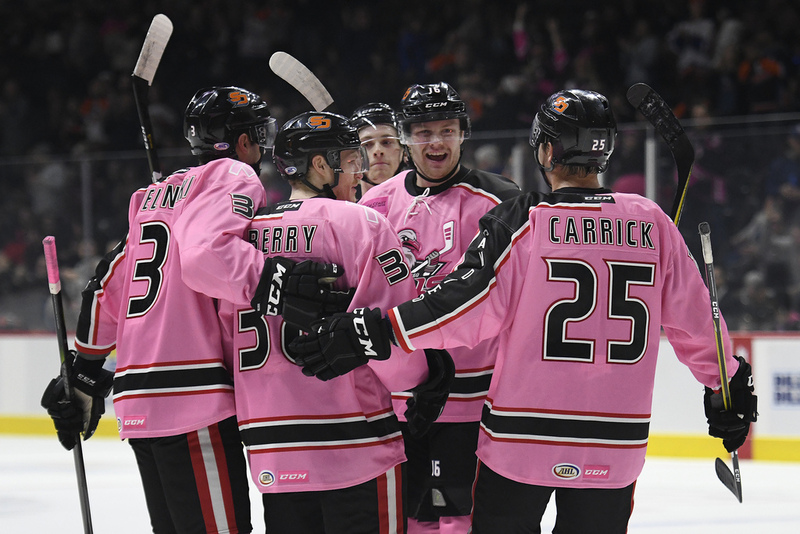 The Gulls wore specialty Pink in the Rink jerseys which were auctioned during the game. Proceeds will benefit Susan G. Komen San Diego which identifies the gaps in breast health care and works to increase access to early detection and quality treatment. Before the game, the Gulls announced they had assigned center Alex Dostie to the Tulsa Oilers of the ECHL. Dostie had a goal and two assists in 29 games with the Gulls this season. The Gulls will try to complete a sweep of their three-game homestand Wednesday when they play host to the Ontario Reign. The Gulls defeated the Los Angeles Kings AHL affiliate, 6-1, on Friday.